Los Angeles Councilman Bill Rosendahl is leading tough talks with the VA to secure $1 million for a comprehensive Phase 2 testing of the West LA VA’s forgotten biomedical nuclear dump. The controversial and incomplete Phase 1 test results showed heightened radiation under two arroyos skirting Barrington Dog Park and Brentwood School football field. The VA says that the $1 million Phase II testing will finally put contamination issues to rest when boring commences in Spring 2008. A 1983 boring of nuke dump heart with over 80 samples taken revealed, nothing yet the government insists on duplicating tests. The Brentwood School athletic fields were built in an area that was used for dumping from three hospitals over decades until the early 1970s. The school insists the property is free of waste even though documents show their seeming complicity in building football field over used syringes, which a report says floated up to the school end-zone surface in rain. Documents also revealed astronomical levels of heavy metal contamination at Brentwood School’s ‘shared’ VA property, where arsenic was found at 32 times the natural level while poisonous thallium was a level the government calls ‘chronic’ for disease. The head of Brentwood School told parents that the government withdrew report of contamination, but documents say otherwise. The VA/Brentwood School contract does appear to indemnify the government from liability over Cold War pollution under fields. The Bush Administration’s attempt to develop the West Los Angeles campus of the Department of Veterans Affairs was dealt a fatal blow Dec. 19, 2007 as both the House and Senate passed legislation by Sen. Diane Feinstein (D-California) and Congressman Henry Waxman (D-Los Angeles) that prohibits commercial development of the 387-acre property. As part of a larger bill, there seems little chance that President Bush will veto the legislation even though the Administration bemoans the loss of $4 billion in potential revenue. 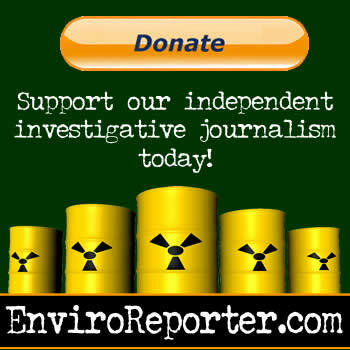 One major roadblock that the Capital Asset Realignment for Enhanced Services (CARES) initiative faced began with the May 18, 2006 publication of “Real Hot Property” in EnviroReporter.com and Los Angeles CityBeat, which exposed the biomedical nuclear and chemical dump on the northern part of this valuable underdeveloped land. The investigation broke the news of radioactive contamination being under exclusive and private Brentwood School’s athletic fields that it leases from the VA. The last CARES meeting was held in September 2005, right as this reporter began asking the VA questions about the dump being under the school. The land may be even more dangerous than previously known. And it shows that in 1983, sub-surface soil boring of the kind proposed by the VA for 2008 testing, found nothing in the heart of the dump despite dozens of drilled holes, some up to nine feet deep. New information reveals that the dump operated longer and was more vast, covering all of what is now Brentwood School’s upper and lower athletic fields. Shocking reports analyzed herein, show that Brentwood School’s athletic fields seem to be contaminated with high levels of arsenic and “chronic” levels of the cancer-causing heavy metal thallium, found in amounts five times those typically found in hazardous wastes sites. This is doubly surprising since the places chosen to test were far away from areas suspected of radiological and chemical contamination yet were off the charts for the two poisons. More concerning is that they were called representative of the soil sampling of the entire athletic fields by other tests. This suspect methodology, repeated throughout environmental tests of the Brentwood School since 1999, is made all the more troublesome in that the school’s contract with the VA says all decisions about hazardous waste on the “shared property” were to be made jointly, yet the Head of School, Michael Pratt, told “Life & Times” differently. The VA nuclear dump in Brentwood is far more polluted, far vaster and potentially more dangerous than previously imagined. Have the VA and Brentwood School tried to literally bury the dump’s potential dangers by characterizing them as harmless to the public and media? Perhaps but, in the process, they may have been derailed by their own documentation that shows evidence of their extraordinary incompetence or possibly deliberate cover-up of Brentwood’s forgotten biomedical nuclear and chemical dump.